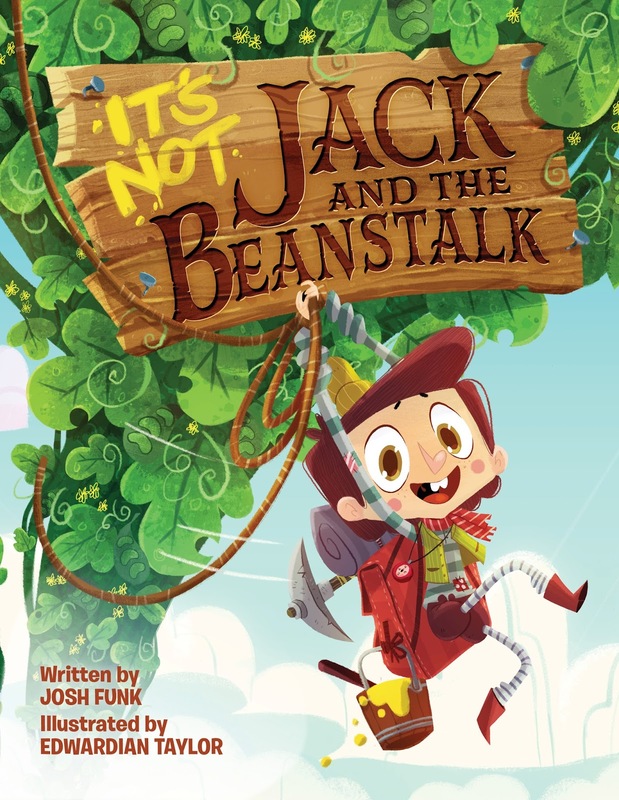 The classic story Jack and the Beanstalk is completely retold in It's Not Jack And The Beanstalk. This hilarious rendition takes us along the traditional story with lots of twist. The inclusion of a narrator telling the story and the characters pipping in with their thoughts lends to the hilarity. Seriously, we laughed as we read this one. I loved how we could talk about the traditional story and then the changes. It gave us the idea to do the same kind of thing with some other classics and make up our own endings for those. I also love the characters in this book because they come up with solutions to the problems and of course it has a happy ending for all. Jack is not fond of the bossy narrator of his fairy tale. When Jack is told to trade his beloved cow Bessie for some magic beans, throw the beans out the window, climb the ENORMOUS beanstalk that sprouts overnight, and steal from a GIANT, he decides this fairy tale is getting out of control. In fact, he doesn’t want to follow the story line at all. Who says Jack needs to enter a life of daring, thievery, and giant trickery? He takes his story into his own hands--with hilarious results. Like Jack, Josh Funk loves telling his own stories. He is the author of the popular picture books Lady Pancake & Sir French Toast and its sequel, The Case of the Stinky Stench, illustrated by Brendan Kearney; Dear Dragon, illustrated by Rodolfo Montalvo; and the upcoming How to Code a Sandcastle illustrated by Sara Palacios in partnership with Girls Who Code. Josh lives in New England with his wife and children. Learn more about him at www.joshfunkbooks.com, and follow him on Twitter @joshfunkbooks. Edwardian Taylor currently works as a visual development artist and character designer for TV and animation feature film. His work can also be seen in mobile games, films, and commercials. He is the illustrator of the picture book Race!, written by Sue Fliess. Edwardian lives in Texas with his partner, their three dogs, and seven chickens. Learn more about him at www.edwardiantaylor.com, and follow him on Twitter and Instagram @edwardiantaylor. Two Lions is offering one copy of IT’S NOT JACK AND THE BEANSTALK to one lucky winner (U.S. addresses). Peter Peter pumpkin water. Makes me laugh. I like to market, to market. When our kids ask us where we are going next and the answer is home, we say "home again, home again, jiggety jig"... like in the rhyme. I like Hickory Dickory Dock. My favorite nursery rhyme is Twinkle, Twinkle Little Star. My favorite is Little Bo Peep. My favorite Nursery Rhyme is Hickory Dickory Dock.